In my previous 3 articles, I really thought I had said all I wanted to say about my dance research and had found everything that could shed further light on the strange ancient dance genus that I seem to have discovered. My last article left a vast time gap of 2000 + years between possible representations of the dance type on five objects from the Near East and a group of Insular Artworks from roughly AD 700 to 900. Figures 1 and 2 are examples from the last article which span the gap. They have features in common it’s true, but are they a coincidence? If there was a temporal and spacial connection between them, was it paralleled by the dance tradition? My efforts to find related art work from the time gap were unsuccessful. Perhaps the dance’s popularity declined and it was kept alive by a small group of people like, as I have suggested, a craft guild. Alternatively, perhaps the fashion for representing the dance declined or it was only represented on perishable items. Taking all the evidence into account I was only 30% confident that the dance had this very ancient Eastern pedigree. Summer 2005. The article starts with a comparison between the Wyresdale Greensleeves (hopping) Dance from North Lancashire and a three-man roundel in the Book of Kells. It considered the possibility that the roundel represents a lost part of the same dance. It then looked at other patterns from Irish and Scottish Insular art and found other closely related danceable possibilities that seem unlikely to be mere coincidence. A detail from a Bobbio Abbey Manuscript was shown and cited as evidence that a dance of this type may have been known throughout the network of Irish monasteries in Europe. Spring 2010. 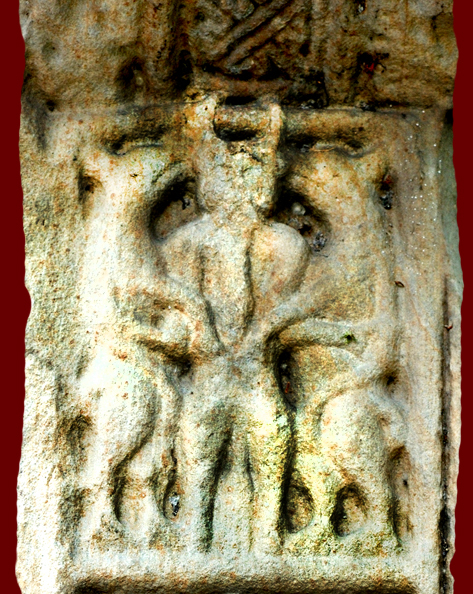 A carving on the Kells Market Cross (shown again here as fig 3) hinted the possibility that a brotherhood of masons were responsible for the manufacture of the cross and that they evolved into the Freemasons of today. An enquiry into the history and ritual of Freemasonry found a clear survival from the long-forgotten days of a mason’s guild dance and a suggestion that masons were very involved in wrestling, as carved on several High Crosses. The leg over arm poses in the Book of Kells and the Bobbio manuscript were linked with the Wyresdale Dance and a spoof or misunderstood Masonic handshake. Spring 2012. Why was this dance so highly revered in Dark Age Ireland? Was it perhaps already very ancient? The theory that the origins of the craft skills that produced the high crosses were to be found in the East was investigated with the help of five examples of Middle Eastern patterns that were presented for comparison with Irish ones. The central ritual of Freemasonry is Eastern involving King Solomon’s Temple. 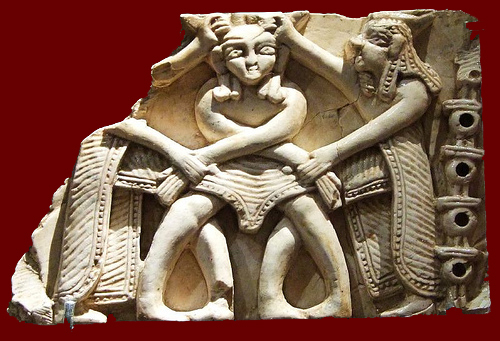 A carved marble disc from Old Babylon was considered in the light of G.I.Gurdjieff’s story of a brotherhood in the city designing dances that would last for many generations. A dance figure suggested by the Babylonian carving was presented. The stimulus for this 4th article was an email from some friends who were going to see Ben Haggerty the actor/storyteller relating the story of Gilgamesh at a local art centre (a spell-binding performance). The previous night they had googled “Gilgamesh” and found a website with an illustration that reminded them of my study. 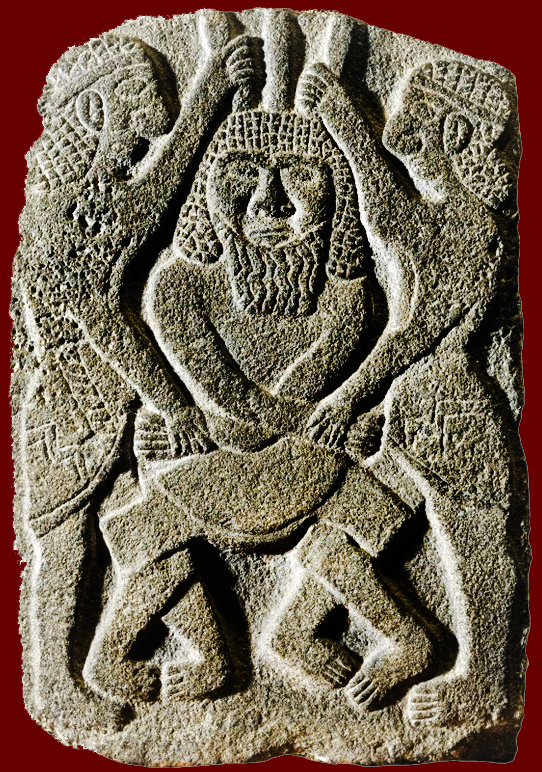 The illustration is fig 4 a stone carving from Tell Halaf in present day Syria described as “Gilgamesh and Enkidu Wrestling Huwawa (Humbaba)” 10th to 9th century BC Neo-Hittite/Hurritic. It is printed here alongside Prof. F. Henry’s drawing from Kells Market Cross fig 3. As with figs 1 and 2, they have features in common but are they a coincidence? As I said in my second article, the staffs held by the flanking figures on this Kells pattern reminded me of the wands of office carried by the two Deacons in a Masonic Lodge. As a new candidate is presented the deacons stand either side, facing in the same direction, with their wands held crossed above and in front of the trio. The pattern is clearly not this position and yet has features in common. A search of Google images yielded two other Eastern carvings of the same subject fig 5 and 6. In figs 3,4, and 5 the leg positions are quiet special but each one is different. If the three persons in the eastern examples are Gilgamesh, Huwawa and Enkidu it seems strange that Huwawa looks like an ordinary human apart from his horns(?) which are strangely represented. In fig 4 he has three horns in fig 5 he has two and in fig 6 the horns appear to have been replaced with daggers. In a translation of the story by Stephanie Dalley, there are the following lines “We hear that Huwawa’s looks are alien....Huwawa’s shout is the flood-weapon, his utterance is fire, his breath is death”. The representations in the carvings don’t seem to do him justice. Whatever the interpretation of these carvings, my question is; was the Irish artist borrowing and adapting a design from an ancient Eastern pattern book and what was he trying to convey? I know of no other interpretation of the Kells pattern so I am inclined to think that it has something to do with apprentice initiation in a forerunner of today’s Freemasonry because my investigation into the subject brought some very rewarding results. The artist has used stock features for a new purpose. Fig 7 is a panel from the fragmentary section of the North Cross at Clonmacnoise. I feel that it must be related to the Kells panel in fig 3 but I am not sure how. Have two flanking figures been eroded or chipped off? There doesn’t seem to be room for them. It has been interpreted as Cerunnos who might be seen as a Celtic version of Huwawa. must be related to the Kells panel in fig 3 but I am not sure how. Have two flanking figures been eroded or chipped off? There doesn’t seem to be room for them. It has been interpreted as Cerunnos who might be seen as a Celtic version of Huwawa. The panel above the one in fig 3 on the Kells Market Cross is shown in fig 8. It has no obvious Biblical interpretation and no exact parallels in the detail, but it is of a widely used form that is known from as early as a cylinder seal from Uruk Mesopotamia 3000BCE. The form has been used for patterns variously classified as “The Gilgamesh Motif”, “Master of Beasts” and “Daniel in the Lion’s Den”. The work of Tina Negus in “Daniel in the Den of Lions.....early medieval carvings and their origins” (Journal of Ethnological Studies.Vol.44,) looks at this subject in detail and her contributions and others in the “Master of Beasts” gallery on flickr are fascinating. Clearly the designers of the Kells Market Cross were using a pattern book, either real or memorised, which was a collection of designs of ancient eastern lineage. For the leg positions in figs 3 and 4 to be so similar suggests that there was a series of actual pattern books or references that carried designs forward for 1500+ years acting as a source of inspiration for artists. Was my dance part of the ancient practices that came to Ireland with this craft tradition? As I followed a line of enquiry into the history of Freemasonry over the last 15 years, I became convinced that the movement couldn’t have simply been invented from scratch in the late medieval period. Some of its features had to have continuity from earlier times and the Irish monastic network appeared to be one of the conduits (perhaps the earliest one) for its transmission into the British Isles. Those that brought about a step change in stone working skills in Ireland were perhaps refugees from the spread of Islam and the Byzantine iconoclasm as suggested by Dillon and Chadwick. Their rituals and culture involving advancement within the craft were the seeds of Freemasonry. This view fits in with an interesting possibility. Medieval craft guilds had patron saints and held their festivals on saint’s days. St. John was held in particularly high regard by masons, but which St. John? Bernard Jones in his “Freemason’s Guide and Compendium” says that some lodges were dedicated to St. John the Baptist, and some to St. John the Evangelist “but it is possible that these saints have been confused with St. John the Almoner”. I would like to suggest another candidate, St John of Damascus born 645 or 676, died 749. This John worked in the Caliph’s Court in Damascus and published three documents criticising iconoclasm and in another document he was very critical of the Quran. Any refugees from iconoclasm and Islam in the 8th century may well have called themselves (St.)John’s Men, a term used by English masons in the seventeenth century according to Bernard Jones. This is of course gross simplification and speculation but it seems to be worth considering. The well-recognised similarities between Syriac and Insular Manuscripts can shed further light on this subject. Another aspect of the history of Freemasonry that intrigues me is the spread of lodges on the continent from a supposed British origin. English Freemasons believed the “Craft” started in England, Scottish Freemasons believed it started in Scotland and French Freemasons believed it started in France. Quoting Bernard Jones again “With regard to French traditions and usages, A French author, J.C.Besuchet, has reported the opinion, in relation to the year 1729, that England had restored to France only what she had already borrowed, inasmuch as Freemasonry in its three first, or symbolic, degrees was of French origin; but there is no agreement, outside France, with that opinion today.” If, as I have suggested in my second article, the Irish monastic network in Europe spread the seeds of Freemasonry, then, 1000years on, this state of confusion is understandable. Bobbio monastery would have brought the culture to Northern Italy where it would have mingled with the remnants of the Roman Collegia that still remembered the skills of the craftsmen of the Roman Empire. These organisations must have had their own systems of advancement within a craft. A brotherhood of masons known as the Comacine Masters emerged in Lombardy in the 7th Century and they are thought to descend from the Roman Collegia. Perhaps they were influenced by Irish practices since both mason brotherhoods would have been working in the same region. Columbanus founded the Abbey of Bobbio in 614. This may have been before the arrival of Eastern masons in Ireland but any Irish influence on the Comacines would have occured during the following centuries as the abbey expanded. According to H.L. Haywood and James E. Craig, A History of Freemasonry, the "Comacine masters" were reportedly the predecessors or "progenitors" of the Freemasons. I am still thinking in terms of Eastern craftsmen reaching Ireland by coastal routes and then following the missionary monks into Europe, rather than arriving in Italy by a much shorter route. As the Romanesque style of architecture developed in Europe the “Master of Beasts” was widely used on the capitals of columns in churches as shown in the Flickr photo gallery. Had it come via Ireland? As I write this article, I am at home in Lancaster about 8 km west of Abbeystead in Wyresdale where the Greensleeves Dance tradition was centred. Why, if this dance was once known from Italy to Scotland, did the dance survive only in this upland part of Lancashire? The tradition is right on my doorstep but I wouldn’t know about it if Cecil Sharp hadn’t kindled local and wider interest by his visit and notation of the dance in 1911. No one in the dale performs the dance today and a dwindling number of locals recall its existence. The only other record of the dance is from Baldersdale in Yorkshire, 72km from Wyresdale across the Pennine moors. Sam Fawcett a concertina player was recorded in 1953 describing the Greensleeves Dance done by groups of four men around 1900. It is clear that the two traditions are connected but how long ago, and is one of them a primary ancient source, or are they just chance implants? The dance may have been left in Wyresdale by the Savigniac/Cistercian monks from Furness Abbey who briefly lived there in the early13th Century. The Furness Coucher Book says “The abbey of Wethney had been founded first in Wyresdale. However, since that foundation had been withdrawn, it has been established in Ireland, where recently the abbey has been built and (a body of monks) then moved out from Furness.” The monks were only in Wyresdale for a few years and don’t appear to have erected any stone structures. The dale is surrounded by the Forest of Bowland and it seems to be a time capsule such as can only survive in rural communities. For example, when I visited Bill Drinkall at Catshaw Farm I asked him how he was related to his near neighbour John Drinkall at Marshaw Farm. “We aren’t related” was his reply. When pushed hard he admitted “well maybe ten generations ago”. It is hard for a townie like me to identify with this sort of continuity. Farm rents in the dale are still paid on Celtic Quarter Days. If you walk uphill directly north from Marmanagh at right angles to the Wyre valley for 3 kilometres you will meet the road from Lancaster to Clitheroe at its highest point on the southern flank of Grit Fell at around 280m elevation. The view from here is excellent. On a very clear day looking SW one can see beyond Blackpool Tower and across Liverpool Bay to Snowdonia and Anglesey. Looking NW one can see over Heysham, across Morecambe Bay to Furness and beyond to the Isle of Man. Ireland should never be visible but a friend has taken photographs that suggest that it might be when there are the right atmospheric, light bending conditions. Slieve Donard is below the horizon beyond the Isle of Man. A local farmer built a viewing tower here to celebrate Queen Victoria’s Jubilee and, due to its popularity, a new car park was constructed in 1973. During preparation of the site the excavator unearthed a log coffin resembling two canoes pegged together. The only remains in the coffin were two pieces of woollen cloth, some hair, a group of finger nails and a group of toe nails. The rest of the body had been dissolved by the acid moorland soil. Radiocarbon dating of the timber gave a 90% chance of it being between 424 and 864 AD. Dr. White of Lancaster Museum says, in his leaflet about the burial; “it is reasonable to assume that the person was of high rank and had some affinity for the Irish Sea”. Where did they live? Down in the valley near Marmanagh where the Greensleeves Dance became a tradition perhaps? 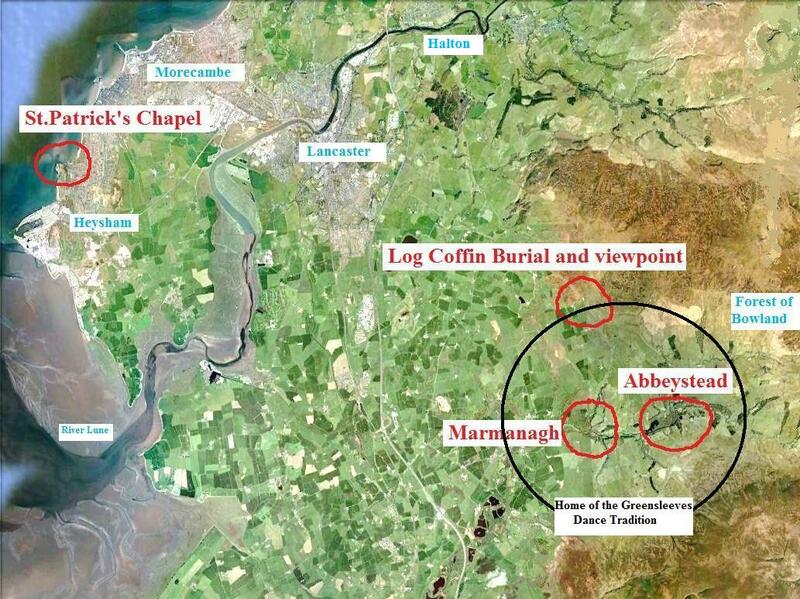 I mentioned Heysham above because of its association with Irish monks and the fact that there are transhumance connections between the coastal lowlands near Heysham and the Wyresdale uplands. On the headland west of the old village are St.Patrick’s Chapel and 50 meters away St.Peter’s Church just 13 km from Marmanagh. An excavation and survey took place there in 1977-78 and was reported in detail in “Contrebis” vol XXI 1996 for the Archaeology and Local History society for Lancashire and the North West (now Lancaster Archaeological and Historical Society) by T.W.Potter and R.D.Andrews. In the report’s discussion it is considered likely that the earliest feature on the site is a group of rock-cut graves or reliquaries on a millstone grit outcrop above the sea (fig10). It speculates that these may have held Irish monks or Saints and possibly even the bones that eventually became regarded as those of St Patrick himself. 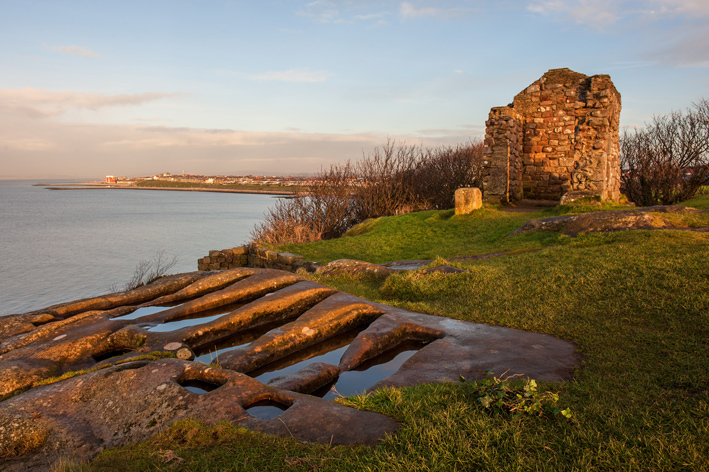 When I visited Heysham as a child in the 1950s to play on the sands and drink the local nettle beer, I was told the legend that St.Patrick was shipwrecked there. After the rock-cut grave burials the next phase was the building of a small chapel probably dating from the 8th century. The chapel was lime plastered inside and out and limewashed prior to painted decoration. It must have looked striking and would, presumably, have been easily visible from the sea. 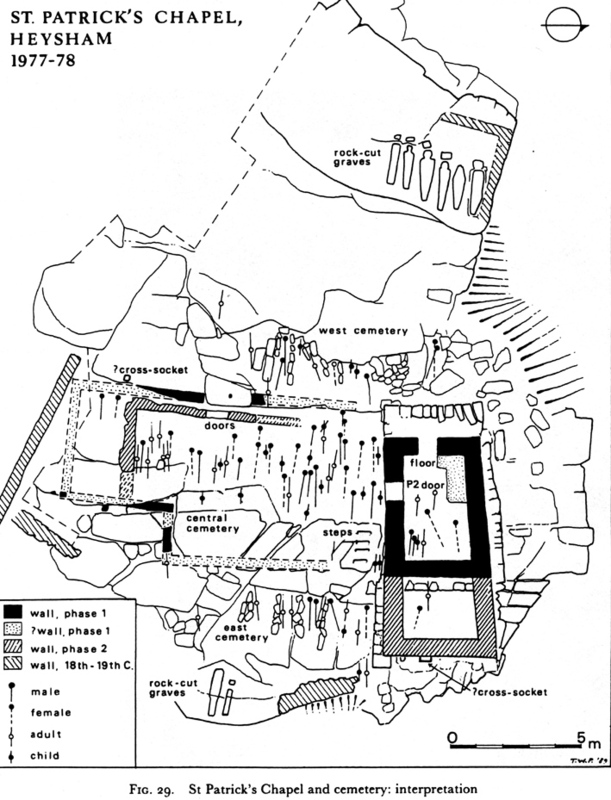 Eventually about 80 burials took place in the chapel and in a small area adjacent on the south side suggesting that it was very sacred ground (fig11). St. Peters Church was also dated to the 8th century and it is in a much more sheltered location. The lower portion of a carved stone cross shaft was found in the churchyard between St. Patrick’s and St. Peter’s and a stone slab carved with a birds head on the underside was found covering a grave near St. Patrick’s. Both were of a local Anglo-Saxon style of the 8th century and related to examples from Lancaster and Halton. There was no evidence of habitation on the site but the sheltered churchyard and a rectangular walled enclosure on the hilltop above the chapel remain unexcavated. A general map of the area around Lancaster is shown in Fig.12. Records of North Lancashire’s Dark Ages are very poor. Lancashire’s County Archaeologists play down any early Celtic heritage at Heysham. It is true , there has been no solid evidence but, like the Port of Heysham today, the sheltered slipway beside St. Peters must have been a focus for travel within the Irish Sea community. As owner of a small sailing boat, I know that Heysham would have been a reasonable landing place between the dangerous tides and shifting sandbanks of Morecambe Bay and the Lune estuary. Several versions of the extended Wyresdale Greensleeves Dance with figures suggested by Insular artwork can be seen on Youtube. My favourite can be found by searching “wyresdale 3 kick”. Bear in mind that it will have changed over the centuries and the kicking chorus may be an add-on. Morris dancing teams have performed the basic dance collected by Cecil Sharp since the 1960s. They have tended to do the dance slowly and pretend to be old men, thus adding to the humour involved, however, I am curious to know how the dance style could change if the speed is increased and timing and fitness are maximised. In 2011 I met Simon Rice, former soloist with The Royal Ballet and gave him a free hand to develop the dance with the boys of the Royal Ballet Lower School. He has choreographed the dance for groups of nine which echo the groupings in the Book of Kells. He has taught it to the boys but they haven’t performed it in public yet. Simon writes,“I included all of the figures and they were ably executed by the boys. The older boys were able to do the extended leg figure with ease. The Book of Kells figure and the Babylonian 5 Man Figure were danceable but I opted for three groups of three. I worked with a complete year group, dividing them into three interlocking groups. In effect, each outside member of each group circled with a member of another group so that the complete group appears to intermingle at various stages in the dance. I called it the Young Man’s Dance because working at a faster pace was far more suitable for the boys and presented more of a challenge, particularly, as they are already very active vocational dance students. I reworked some of the figures to give the content more continuity and to give an appearance of being seamless. I also changed the order to make the dance look less predictable and more surprising for the onlooker. As I work as a choreographer, these are skills I harness for this work as, I often find English Folk Dances to be rather too predictably structured. In fact what I like about the Wyresdale Dance is that it looks so different to just about any other English Folk Dance and at the same time athletically challenges the individuals involved. Perhaps it could only be done, in a completed version, by trained dancers or gymnasts. I think it is a fun dance to watch as well and the unpredictability of the dance makes it all the more joyful for the onlooker. This is important at a time when dance in general is becoming more varied and more sophisticated, whether in a traditional, more contemporary or street dance form”. I hope they will perform it in public eventually. Fig 1. The pattern on a clay disc found during the Andre Parrot’s excavation of the Palace of Mari . Fig.3 F.Henry’s drawing of a panel on the Kells Market Cross. Fig.4 This relief decorated the lower course of the exterior wall of the temple palace of King Kapara. Two heroes pin down a bearded foe, while grabbing at his pronged headdress. The context may be related to the Gilgamesh epic, and display Gilgamesh and Enkidu in their fight with Humbaba. Fig.6 Carchemish 750-700 BC. 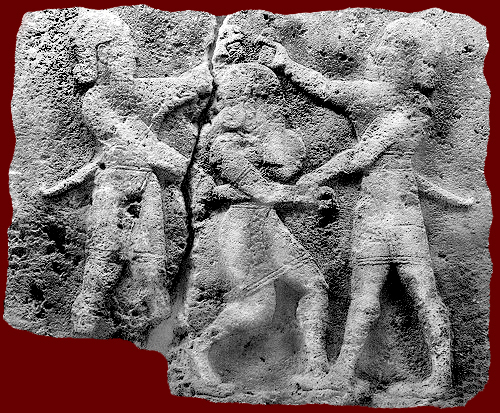 A Late Hittite relief under Assyro-Aramean influence. The cut of hair is Assyran, the ringlets of the hair and beard are in Aramean style. 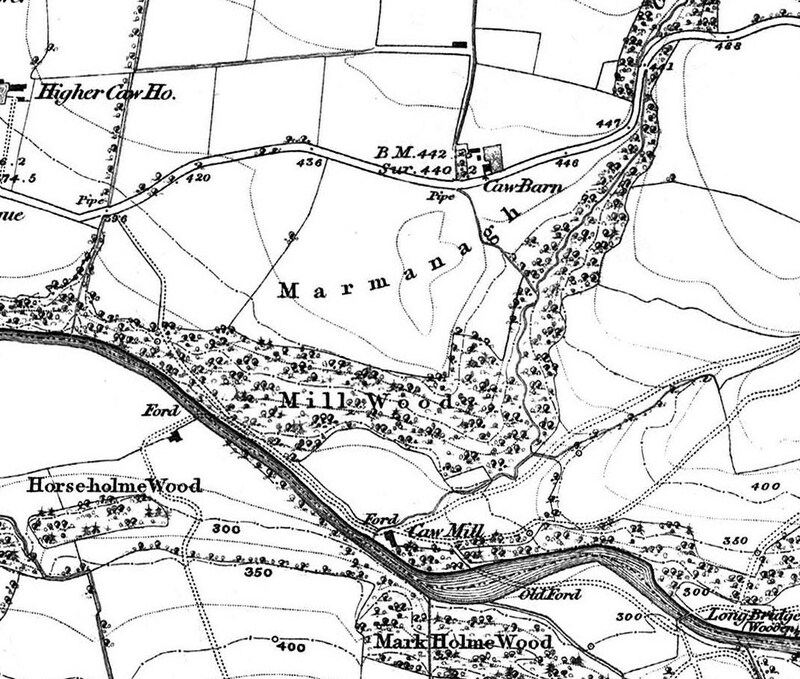 Fig.9 Detail from the first Ordnance Survey Map of England Mid 19th C showing Marmanagh. Fig.11 An interpretation of the area around St.Patrick’s Chapel Heysham after the 1977/78 excavation. Lancaster Archaeological and Historical Society. Fig.12 A map of the area around Lancaster. Google Earth/ Alan Nowell.